Hints re-examination for over 6.3 lakh students who appeared this year. Counting days over the menace of cheating, through electronic devices for AIPMT 2015, the wait seems to be finally getting over for the students. However, the news is not as good as they wish it to be, going by the statement of the defense lawyer for CBSE in the media. In context of Supreme Court hinting a re-test of the All India-Pre Medical Test Examination, the lawyer for CBSE has been quoted as saying,” that the six lakh candidates should not be punished for few. So far only 44 erring students had been identified and vouched for declaring the results”. However, the apex court is of the opinion that while the probe is still on, the scam will unfold in its due course, and is suspected to be deeper with as many as 350 phone leaks being identified till now. “The entire exam stands violated if even one erring student is not identified,” it said. The Haryana police, which is conducting the probe, is stated to have revealed the fact that the gang involved in the scam has its tentacles spread, and established across the country. Alarmingly hinting towards the grave concern of the nation that the figure of 44 students busted in this racket till now might go up significantly. 700 students are suspected to have carried advanced electronic devices, for easy maneuvering of the answers-inside the examination hall. It implied the gang, including doctors and MBBS students managed to get hold of the question paper, and was able to electronically transfer the answers to those who willfully appeared for the exam. Police said that 102 out of 123 answers transmitted to students were correct. 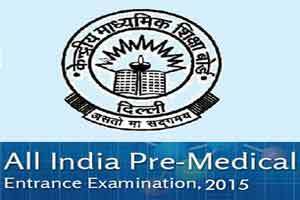 India’s top undergraduate medical entrance exam the CBSE All India Pre-Medical Entrance Test (AIPMT) 2015 stands to be cancelled in lieu of the Supreme Court holding an opinion that the sanctity of the exam had been compromised this year. The results were to be declared at the June 5. The modus operandi of the cheaters is believed to be using latest communication technology such as Whatsapp to scan the questions, in few cases, and sending the answers to the group of students who has prepaid for this service. The police have till now retrieved more than 300 SIM cards which were used in this enormous network of around 10 states in the exam centers.